There are many discussions about the nursing shortage in the U.S., but there are also reports of unemployed nurses, especially among new graduates. What is the explanation for this contradiction, and more importantly… where are the nursing jobs? Before answering the question, “What part of the U.S. nursing job market is easiest to get into due to the nursing shortage?” it is essential to take a step back. It is important, first, to understand the changes going on within the healthcare system and how these changes are affecting nursing as a profession. 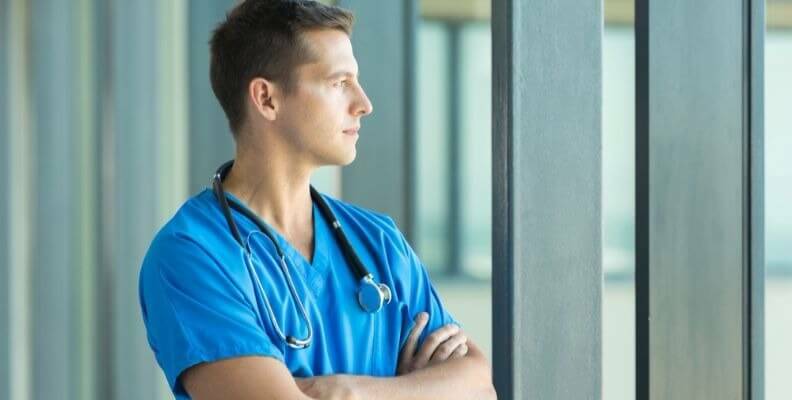 There may be a time gap before these forces of change are fully actualized in the job market, but they will be reflected in the training that nurses will be receiving and the types of job openings that will be occurring with more frequency. • Healthcare is changing in emphasis from an illness treatment model to a disease prevention/health promotion model. An aware and technically sophisticated public can be reached and informed about disease prevention and healthy lifestyles. Nurses are at the forefront in meeting the public’s need for proactive health. • Long term, chronic diseases make up the majority of healthcare needs in the U.S. today. Diseases like cancer, diabetes, cardiovascular disease, Alzheimer’s and arthritis take up the bulk of medical treatment today; in 2010, they accounted for 86 percent of the nation’s healthcare costs. It follows that nurses are in demand for long term care for these illnesses. • Many hospitals are closing their inpatient units and concentrating on emergency and intensive care. Post-surgical care is increasingly being provided on an outpatient basis, either in a community facility or at home. Increasing numbers of hospitals are closing down units that do not make money, or that operate on a loss. Long inpatient stays are going by the wayside, and hospitals are revamping to stay solvent. • Correspondingly, outpatient care centers are on the rise. Freestanding healthcare facilities such as ambulatory surgery centers, urgent care clinics, long term acute care centers, specialized rehabilitation facilities, primary care clinics and a variety of other community health centers are increasing. The healthcare industry is responding to both the public’s needs, and the financial needs of parent and overseeing organizations. • The U.S. population is getting older, with predictions that by 2030, one in five Americans will be over 65 years of age. The National Council on Aging reports that a staggering proportion of older adults—92 percent—have at least one chronic disease , and 77 percent have at least two. A large proportion of the nursing workforce will be dedicated caring for this population. • A widespread shortage of physicians places pressure on the nursing profession to fill the gap. The demand for advanced practice registered nurses (APRN), especially nurse practitioners (NP), is expected to grow at a high rate. This can help patients access care, as the MD shortage continues to make providers hard to find and even harder to get an appointment with. • New knowledge in medical care requires more nurses advanced training and experience in a variety of specializations. Specialization is an increasing trend, as medical procedures become more intricate and as technology continues to advance at an exceptional rate. • Technology is changing how medical services function. The specialty in Nursing Informatics tries to bring this knowledge to working nurses and other health professionals. Telehealth and telemetry are relatively new practices that expand the reach of nurses and medical professionals to distant areas. • Shortages of nursing faculty, nursing training facilities and clinical sites continues. These shortages perpetuate the insufficient supply of registered nurses, and makes it difficult to prepare the new nurses who are needed to replace the RNs who will be retiring in the next 10 to 15 years. Where are the Nursing Jobs? What do the above trends mean in terms of where nurse applicants can expect to find jobs? In general, jobs in popular locations like the coasts and in affluent areas are harder to get than jobs in poor or rural locations. Thankfully, healthcare is needed everywhere, so chances are you can find open nursing positions in your area or in a place you are willing to relocate to. The U.S. Health Resources and Services Administration provides data on the medically underserved areas in the nation. These are areas that have a shortage of primary care providers and also have a high infant mortality rate, a high poverty rate and/or a high elderly population. The majority of the states that have 80 to 100 percent of counties that are medically underserved are located in the south and southwest along with the states of Utah, Iowa, North Dakota, South Dakota, Pennsylvania, Vermont and Maine. Nursing jobs in these areas may be easy to find and apply for. The states with the lowest concentration of underserved counties are Alaska, Nevada, Colorado, Ohio, Indiana, New Hampshire and Florida. Typically, it can be harder to find open nursing positions in these states, especially as a new graduate nurse. The American Nursing Informatics Association (ANIA) provides a job search website that will allow a job seeker to search for jobs in the U.S. and Canada by position and location. For the general category of “Nursing,” a search in the fifty states and the District of Columbia yielded the following results as of April 2016. • The states with the highest number of job postings were: Pennsylvania – 378, Florida – 257, Illinois – 199, Texas – 166, California – 143, Virginia – 113, Delaware – 88, Colorado – 63, Louisiana – 56, North Carolina – 52 and New York – 51. • The states listing the fewest number of positions were: Idaho – 5, Wyoming – 5, Kansas – 4, Mississippi – 4, Nebraska – 4, New Hampshire – 3, Hawaii – 2, South Dakota – 1, Vermont – 1 and West Virginia – 0. Travel nurses are increasingly being hired by medical facilities facing short term vacancies or shift shortages that require experienced nurses. There are a number of travel nursing agencies that will help a nurse to find a suitable position in a location of choice and assist with licenses and travel accommodations. Most travel nurse positions require two years of experience and a commitment period of eight to 26 weeks. A travel job may end with an offer of a regular job. Completing further education greatly expands job opportunities for nurses at all levels. APRNs with a Masters or Doctoral degree are in high demand in all specializations and all locations with considerably higher salaries. Since the BSN is increasingly being required for registered nurse positions, an RN with a diploma or ADN might consider one of the RN-to-BSN programs that are conveniently offered to working nurses in many colleges across the country. Nursing Informatics is a rapidly growing specialty with job openings not only in health facilities, but in insurance, pharmaceutical, government and other settings where nursing knowledge and experience provide a needed clinical base. There are a number of hospitals and medical systems that offer new-graduate one-year residency programs with an agreement to continue employment beyond this period. Indeed.com has a job listing for New Grad RNs for residency programs in hospitals and medical centers around the country. Residencies provide excellent opportunities for new grads to build clinical competence and gain experience while being trained and supported by senior staff. Another opportunity for new grads is the NHSC Nurse Corps Loan Repayment Program that provides the double benefit of allowing you to gain experience while working off a student loan debt. The idea is to work at a designated critical shortage facility in a Health Professional Shortage Area (HPSA). A two-year service agreement typically pays off 60 percent of a loan debt, while a three-year agreement pays off 85% of debt. Other possibilities for new graduates include the Veterans Administration, which hires both LPNs and RNs in a variety of healthcare settings around the country, and home health and assistant living jobs that do not usually require extensive work experience. Some hospitals and medical facilities also offer temporary or per diem jobs to supplement their staff for night shift or weekend positions. These less desirable assignments could lead to a stable position after experience and notable job performance. Seasoned senior nurses advise new graduates to be flexible in their choices of a first job. This is a time to test your theoretical knowledge and translate that knowledge into practice. You should also look into joining professional organizations and become actively involved. Use your connections to network with others and build skills in communication, teamwork, time management and responsibility. Once you’ve earned your nursing license, you’ve already positioned yourself in one of the most highly demanded and respected professions. There are many opportunities regionally and nationally, and with some extended searching and flexibility you may find that helping to combat the nursing shortage is not only good for the health of patients, but is also the doorway into an exciting future in a noble career.